Illinois Divorce FAQ | Berry K. Tucker & Associates, Ltd. Check out the answers to some of the most frequently asked questions regarding divorce. Please keep in mind that these include the answer to general situations and are not meant to be taken as legal advice. They are designed to help understand the nature of divorce law in Illinois. For more information regarding divorce and help with your case, check out the divorce attorneys at Berry K. Tucker & Associates, Ltd., serving the southwest Chicagoland area. Check out the Illinois Divorce FAQ below. 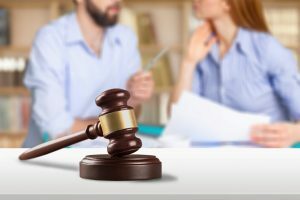 What are the reasons for getting a divorce in Illinois? Upon filing for divorce, the petitioner, or the one filing must have legal reasons of why they want out of the marriage. These reasons are called grounds, in which there are two types: fault (you would explain the problems created by your spouse that caused your marriage to fail) and irreconcilable differences. What are the fault grounds for getting a divorce in Illinois? Are the court’s decisions about alimony, child support, or property division affected by fault? No. Even if the spouse can prove that the other is at fault for the destruction of the relationship, it does not affect any decisions towards alimony, child support (maintenance), or property division. What are irreconcilable differences in divorce? Irreconcilable differences can be considered as the grounds for a “no fault” divorce, which includes the majority of most cases. 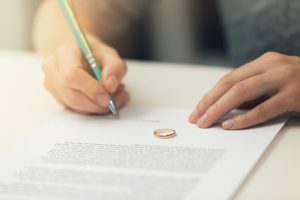 In this situation, the spouse petitioning for the divorce must claim that the marriage failed due to irreconcilable differences and future attempts at fixing the marriage are not in the best interests of either party. The requirements to file under these grounds include being separated for at least 2 years. Although as long as both parties sign the waiver, they are allowed to file after 6 months of living separately. What happens if my spouse files for divorce and I don’t want one? Illinois law will allow you to contest the reasons, or grounds, for divorce, but it doesn’t require that both spouses continue living together. But overall, attempts at restricting the divorce would be useless. Can the court help me with anything else that concerns my divorce? There is no specific amount of time that divorces will last. The quickest divorce can last between 3 and 4 months, given that there are no disagreements and all paperwork is filed. However, when there are a number of complications, a divorce can last over a year. Delays in the other attorney’s schedule. It can be difficult to schedule court dates due to busy schedules or uncooperative attorneys. In addition to these, the most common factor that can cause delays are disagreements and distempers of both parties towards eachother. But if you can convince your spouse that numerous court dates will require more expenses, you may be able to end the divorce sooner than later. There is no black and white number for each divorce, given that there are so many factors. Although the average cost of divorce in Illinois is about $13,800, including attorney fees, according to lawyers.com. Keep in mind that if you let your anger towards your spouse affect your decisions, you can expect a long and expensive process. Illinois law doesn’t require that both spouses have an attorney, however, it can make a significant difference in the results of the case. Especially if you and your spouse have many disagreements, the divorce process can seem complex and overwhelming. Can I make my spouse pay my attorney’s fees? Generally, no. Although there are some exceptions that if one spouse holds the majority of both parties funds, the court will order that spouse to assist with the fees as well as additional living expenses, known as spousal maintenance. If you are the one in need of the financial resources to pay for the fees, you must prove to the court that you are financially incapable. Although if you don’t comply with any court orders both during or after the divorce case, you will be forced to pay the fees yourself. Is it OK to see other people during the divorce process? Yes. Although keep in mind that this may cause problems during the case between you and your spouse, causing them to “fight harder.” Also consider the possibility of upsetting or confusing your children, if involved, and even affect custody decisions. What happens if my spouse spends most of the money before or during the divorce? If your spouse spends a significant amount of money before or during the divorce that is for their own personal benefit, instead of the family’s, it is known as a dissipation of assets in Illinois. The court will take this into consideration and can grant you, the non-dissipating spouse, a portion of the money spent. If you feel suspicious that the other party is about to spend money but hasn’t done so already, you can ask the court to issue a Preliminary Injunction, disallowing you and your spouse to “improperly use finances.” Another option would be to split up the bank accounts at the beginning of the case to bar access to eachother’s individual funds. What happens if I change my mind after filing for divorce? It is common that people change their minds after filing for divorce. Simply notify the court to dismiss the case, or if you want to do so “temporarily,” this is also possible without dismissing the case. You can also file at a later time. What can I do about the emotional pain? If you are suffering emotionally, know that you are never alone. Divorce is one of life’s most painful experiences. It is common to feel like riding an emotional rollercoaster, even if both you and your partner are ready to move on; the stress alone can create tension between you and your spouse. To help ease the pain, check out these tips on how to get over a divorce, or you can look into counseling. A professional can help with accepting the end of marriage, develop coping skills, and moving forward in life. If you aren’t sure where to start, your divorce attorney, friends, family members, or family doctor can recommend a qualified counselor. It’s common to have many questions about the divorce process, especially if this is your first. Many questions can also be specific to your situation, and therefore can only be answered by an experienced attorney. If you feel that you are in need of legal advice or help with your divorce process, simply contact our divorce attorneys. Our lawyers at Berry K. Tucker & Associates, Ltd. have over 50 years of combined legal experience, including numerous divorce cases. They have also helped a number of men and women finalize their cases with solutions serving their best interests. We can also help with child custody, child maintenance (support), property division, domestic violence, and more. Give us a call at (708) 425-9530 for more information about our divorce attorneys or to speak with them directly.